This line is one of the most successful within the project, with a very low mortality rate and a nice solid growth rate. 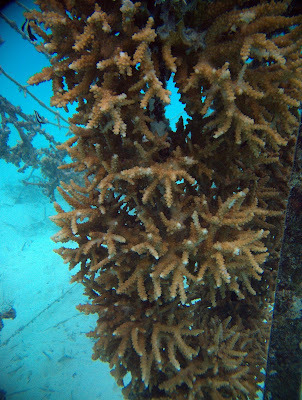 Having reached it's first birthday, this line will shortly be placed on the reef, where we hope it will remain healthy! 2.5 year update: We are sorry for not updating your survival data on the graph below, but as you will see from the photograph at 2 years and on the right, the colonies have become very difficult to tell the difference between! This line is growing extremely well, kept in the nursery passed its 1 year mark due to the El Nino event in April 2016. The line survived well through the El Nino induced bleaching, despite the same species dying out on local reefs! However, it was the victim of a Crown of Thorns Starfish which managed to climb the nursery frame and eat some of your colonies! We got rid of him and your line has grown well since. We will be transplanting soon!